Rise & Shine aims to thrill retro gamers, but ultimately misses the mark thanks to a number of frustrating design decisions. When I first previewed Rise & Shine late last year, I really enjoyed that early taste of the game. Best described as a fusion of Metal Slug and a bullet hell shooter, Super Mega Team’s delightfully self-aware romp through a retro-tinged world was incredibly charming, and packed a satisfying blend of satisfying run-n-gun gameplay along with some surprisingly cerebral puzzles. After wrapping up the meaty demo, I was left with high hopes for the game’s final release. Sadly, it seems the best moments of Rise & Shine are also the ones found in that early morsel we received, as what starts as an incredibly addicting and imaginative shooter quickly devolves into two-hours of frustration and disappointment. Before we get into all that, though, let’s take a step back and go over the basics for those who missed our earlier coverage of Rise & Shine. The game tells the story of Rise, a young boy who becomes an unlikely hero when the peaceful world of Gamearth is invaded by the militant forces of planet Nexgen, which fittingly is comprised of nothing but bulky bandanna-clad space marines. 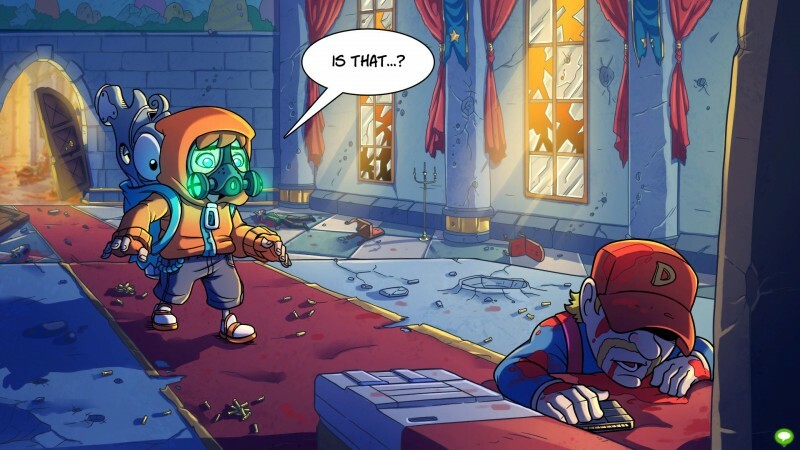 After gunning down the legendary hero Blink, who looks an awful lot like Link from The Legend of Zelda, Rise inherits Shine, a sentient gun that grants him infinite re-spawns, and with that the ability to save the world. Say what you will about Rise & Shine, but there’s no denying it’s a sight for sore eyes. And let me tell you, you’re going to need ‘em. To put it mildly, Rise & Shine is a game that revels in crushing a player’s spirits. Death is your constant companion, and you’ll quickly find yourself smashing the re-spawn button as you meet countless messy demises. I’m all for a challenge, and I’m no stranger to the run-n-gun genre by any stretch, but this game almost seems designed to frustrate the player. One glaring issue is the game’s twin-stick style aiming, which is incredibly finicky, making lining up even seemingly easy shots more of a hassle than it should be. Often times you’re better off falling to the nearest (sparse) piece of cover and firing into the sky wildly, hoping you down one of the half-a-dozen enemies swarming overhead, raining down fire. Other times you’ll find yourself killed by landmines that suddenly burst from the ground without warning, causing you to restart from the last checkpoint. However, it seems the developers are keenly aware that you’ll die constantly, and the nearest checkpoint is always just a few steps before your last bloody death. Still, this trial-and-error approach to progression simply isn’t very fun, and it’s a major departure from the genre greats like Metal Slug and Contra, where pattern recognition and perfect timing were the keys to success. 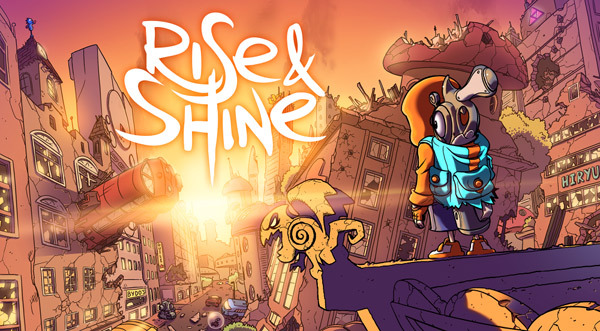 In comparison, Rise & Shine just feels sloppy and challenging for all the wrong reasons. Rise & Shine’s self-referential humor starts out entertaining, but quickly wears out its welcome. It’s a shame the game is so frequently frustrating, because when things come together Rise & Shine can be a lot of fun. It just seems like you’re never more than a few minutes from getting bogged down by a maddeningly unbalanced encounter. And given the game’s brief length – the story can be completed in just two hours – far too much of Rise & Shine’s package is bogged down by inelegant mechanics and cheap deaths. Rise & Shine does have some things going for it though. For starters, it’s absolutely gorgeous. 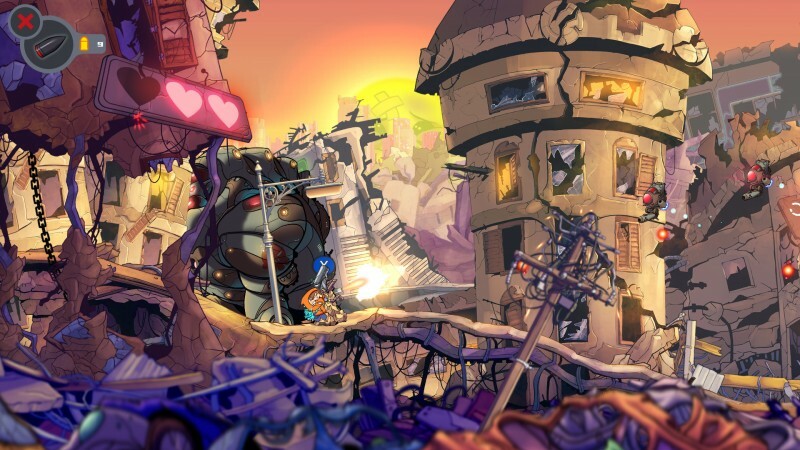 The hand-drawn art style is reminiscent of classics like Metal Slug, but much more vibrant and colorful. Character models look great, and feature an impressive amount of detail, and you’ll find plenty of pretty particle effects accompanying the frantic boss battles that simply explode off the screen. 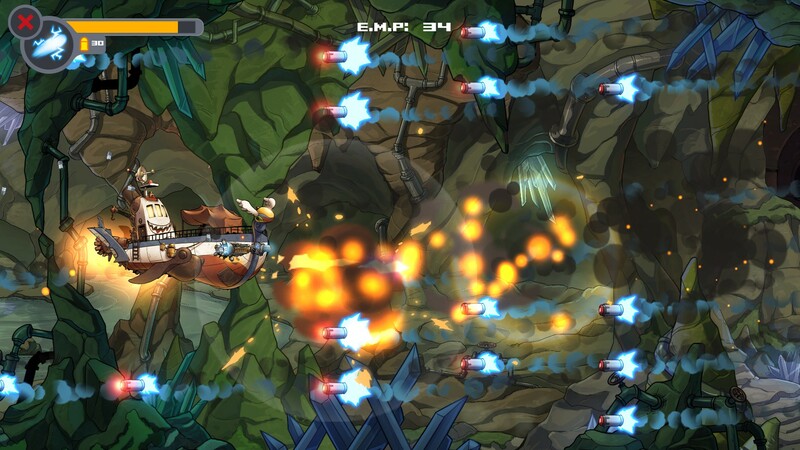 You also gain access to a number of interesting add-ons for Shine, such as explosive rounds that arc to hit targets behind cover, electric rounds that stun mechanical enemies and charge objects that need power to function, as well as a handy guided bullet that rides nearby radio waves, allowing you to steer your shots over wide distances to hit hard to reach targets. These weapons add some welcome variety to the mix, and are often used in inventive ways to solve puzzles, which are surprisingly clever, and prove to be one of the more enjoyable aspects of Rise & Shine’s package. This horizontal shooter segment found late in the game provides a welcome change of pace. On the aural front, Rise & Shine is also a join to listen to. The game features plenty of pumping orchestral tunes and touching arrangements that almost seem out of place in their grandiosity, and they do a great job of pulling you into the on-screen action. Hell, you’ll probably find yourself compelled to pick up the digital soundtrack for this one. It’s simply that good, and you’ll be hard-pressed not to find yourself humming along to the score – at least in between expletive-filled outbursts thanks to the game’s soul-crushing difficulty. Rise & Shine isn’t terrible by any stretch, but its brief campaign is really held back by some frustrating design choices that will agitate all but the most masochistic run-n-gun shooter fans. And while the game begins as a love letter to the glory days or retro gaming, I have to admit that before long the sense of humor wears thin as references to classic games are shoehorned into almost every step of the journey. Still, you do get to finally shoot the smirk off the dog from Duck Hunt’s face, so that’s a plus. With a little more polish Rise & Shine could have been a must-play title. As it stands, those who are dying for a run-n-gun shooter to soothe that itchy trigger finger may find what they’re looking for here. However, if you’re not willing to suffer through hundreds of frustrating deaths in pursuit of fleeting moments of shooter euphoria, spend your bullets elsewhere. 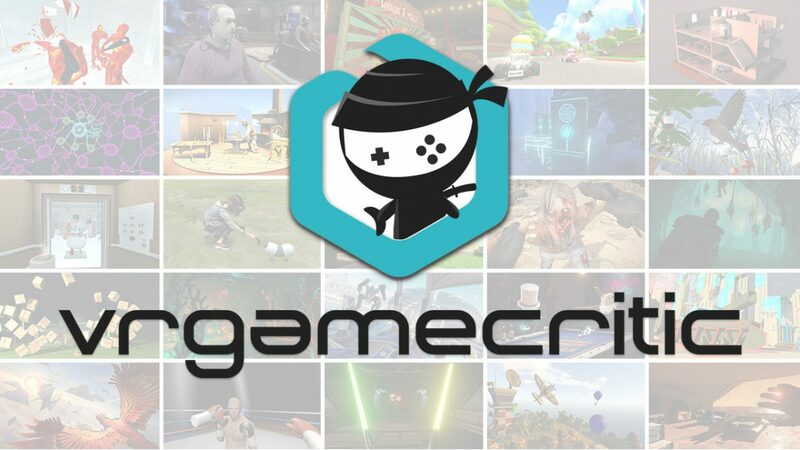 If you want to check the game out for yourself, you can do so here. Full disclosure: This review is based on a copy of Rise & Shine given to Hey Poor Player by the publisher.